Uttarakhand School Education Board had released notification for recruitment of 5371 Guest Teachers LT Cadre for Government Schools of the state. The eligible candidates can apply online through application form available on official website www.schooleducation.uk.gov.in for recruitment of 2699 posts of LT Cadre and 2672 posts of Lecturers. The final selection of the suitable candidates will be done on the basis of merit list prepared on the academic performance of the eligible candidates. The last date to apply online for UK Guest Teacher (Lecturer & LT Cadre) recruitment 2015 will be 15th July 2015. The qualification required for recruitment of UK Guest Teacher (Lecturer & LT Grade) will be mentioned in the notification released by UKSEB. The qualification required for UK Guest Teachers vacancy 2015 will be appropriate according to the post of the candidates. Candidates are advised to check educational qualification before applying online for UK Guest Teacher (Lecturer & LT Grade) recruitment 2015. Latest news is that UK Guest Teacher (Lecturer & LT Cadre) Recruitment 2015 Notification has published on official website. A huge numbers of candidates are interested to apply online for UK Guest Teacher Recruitment 2015. 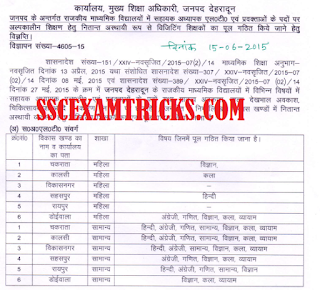 How to apply online for Uttrakhand Guest Teacher (Lecturer & LT Cadre) Recruitment 2015: It is easy to apply online for UK Guest Teacher Recruitment 2015. There are simple steps are given so that candidates can fill online application form for these Guest Teachers posts. Click on Apply Online Direct link given on the page. Fill your particular details in BLOCK LETTERS in online application 2015 online application form. It is mandatory to fill Red Marked column in online application form for UK Guest Teacher Recruitment 2015. Upload the photo and signature to the prescribed format. Click on submit button provided at the bottom. Note down application ID and password for UK Guest Teacher (Lecturer & LT Cadre) Recruitment 2015 online application form. Take print out of online application form for UK Guest Teacher Recruitment 2015. 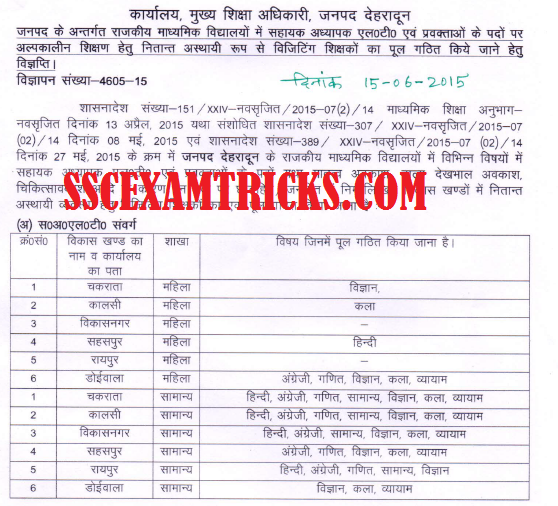 It is advised to the candidates that they must read carefully official advertisement for Uttarakhand Guest Teacher (Lecturer & LT Cadre) Recruitment 2015 to know about age limit, eligibility and qualification, how to apply online for Guest Teacher posts which are mentioned simply in detailed advertisement.